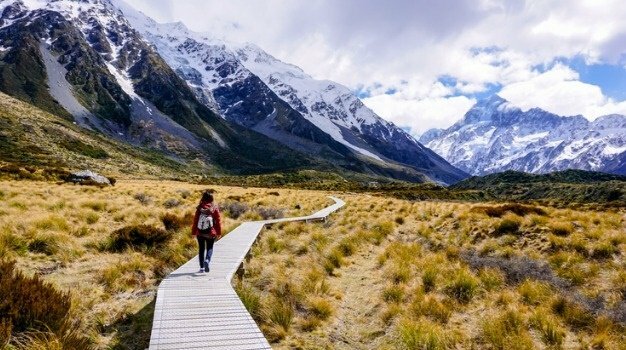 Known for its wine, seafood and products like Manuka honey, New Zealand has so much to offer visitors in terms of markets, traditional food experiences and locally-produced foods. New Zealand's seafood offering is magnificent. From Paua (Maori word for abalone) to crayfish and green-lipped mussels, it has it all - and more! Eat green-lipped mussels in the mussel capital of New Zealand, Marlborough. Whitebait, an immature fry of fish, is a very popular seafood in this part of the world. Particularly found in the rivers of the South Island’s West Coast, you cannot visit NZ and go without trying it. Crayfish is found everywhere in Kaikoura, it's up to you whether you want it served up-market or go for humble and eat it plain-and-simple from a crayfish shack. Hangi is a traditional Maori cooking method. Fish, chicken and root veggies are wrapped and buried in a pit oven made in the ground. Heated rocks cook the food to perfection for three or more hours while you wait in anticipation. This is an authentic experience to have as a group. New Zealand has an ever-growing and thriving dairy industry. And the trade of cheese-making is very much alive. Go and taste smelly, vintage and soft cheese at artisan cheese shops like Puhoi Valley Cheese Co. Apparently there is a bit of controversy around the subject of who invented the first Flat White. An Auckland cafe known as DKD has claimed its birth, yet Australia has also named itself as its inventor. Either way, the Kiwi Flat White is very much a thing in NZ. Coffee is taken seriously here, and served strong. So if you're keen on a caffeinated states of being, NZ might just be up your alley. Expect wine region upon wine sub-region when travelling NZ. All known for different cultivars, go visit the Hawke's Bay area for Cabernet and Merlot blends, Syrah, Chardonnay, and the region of Gisborne for Chardonney and Pinot Gris. Auckland, with its volcanic, clay-rich soils is again best known for serving-up intense Cabernet blends. Here is a list of some of the best wine tours on offer.